Lowdown: A hitman finds needs to kill his future self in order to survive in the present. Time travel movies seem to be a dime a dozen these days. 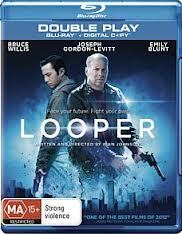 They all suffer from that good old time paradox credibility problem, but some handle it better than others; in Looper's case, which happens to be the case of this particular review, the movie is all about the time paradox. As in, you know that good old question of what would happen to you were you to kill your father? Well, that roughly is what Looper is all about. Our hero is Joe (Joseph Gordon-Levitt), only that he's not really a hero in the classic sense of the word. Living in our future, he's a hired killer with a twist: his job is to kill people sent back in time from his own future. Apparently, in the future it's hard to get rid of bodies; the easiest way is to send them back in time to our Joe for execution and disposal. Joe is good at his job and he saves a lot of money as a result, but there is a catch: his last kill would be his thirty years older self, which would thus conclude his contract. Only that his thirty years older self (Bruce Willis) is not so keen on dying; he has found himself in the future, turned good by the love of his life, and he's not about to give up on that life for the sake of this younger no good killer that he was. Thus younger Joe has a quarrel with older Joe, aided by the fact his gang of criminals want Bruce dead just the same but hindered by them not minding killing him in order to get Bruce. Add to the equation a lovely lady (Emily Blunt, who seem to specialize in this science fiction niche since The Adjustment Bureau) as a single mother and a love interest and you got yourself an action flick with a bit of a twist. A time paradox twist. I heard of people that thought Looper was the best thing ever and I heard of people who responded with a "meh". I'm somewhere in between: Looper is good entertainment, and if you're looking for meaning then this old and wise vs. young and restless is a good analogy for what happens to us all as we get old; it's a somewhat good analogy for the friction between generations in general. Yet I have one big reservation and it is to do with the whole setup: sure, let us assume time travel is available; would you really expect it to be used solely for the purpose of body disposal? Why not travel back in time to win the lottery or make a killing at the stock exchange? Indeed, the movie seems like it's too much in love with itself. For example, in order to cater for the major twist that has to come at its end, it introduces the whole complicated concept of mutants. Again, that's a big stretch that hurts the film's credibility. Overall: A nice action film that would have probably been a terrific short given its shoddy background story. Such circumstances would not require as much thinking. In this incarnation, though, I will give it 3 out of 5 stars.